Tablets for dogs. Kills roundworms & tapeworms. Effective in one dose. Dogs up to 40kg. What does this product do? Wormclear® is for the treatment of mixed infections caused by gastrointestinal worms (roundworms & tapeworms) in dogs. 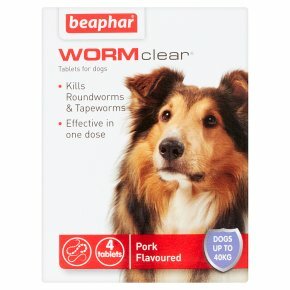 Is this product suitable for my dog? Do not use in dogs less than 2 weeks old or weighing less than 3kg.The tablets can be divided in two or four equal doses. For routine treatment a single dose is recommended. In case of suspected heavy roundworm infestation, please contact your veterinary surgeon for diagnosis and treatment recommendation. Do not use in pregnant dogs unless advised by your vet. If your dog is receiving other medication, check with your vet before using this product. Do not use at the same time as other wormers, or if your dog has an allergy to any of the ingredients. USER WARNINGS<br>Keep out of the sight and reach of children.<br>For animal treatment only. In case of accidental ingestion, seek medical advice and show the package leaflet or carton to the physician. Wash hands after administration of tablets.